SMERSH was an umbrella organization for three independent counter-intelligence agencies in the Red Army formed in late 1942 or even earlier, but officially announced only on 14 April 1943. The name SMERSH was coined by Joseph Stalin. The main reason for its creation was to subvert the attempts by German forces to infiltrate the Red Army on the Eastern Front. The Jews have a long history in Hungary, with some records even predating the Hungarian conquest of the Carpathian Basin in 895 CE by over 600 years. Written sources prove that Jewish communities lived in the medieval Kingdom of Hungary and it is even assumed that several sections of the heterogeneous Hungarian tribes practiced Judaism. Jewish officials served the king during the early 13th century reign of Andrew II. From the second part of the 13th century, the general religious tolerance decreased and Hungary's policies became similar to the treatment of the Jewish population in Western Europe. A person may be legally declared dead in absentia, i.e. a legal presumption of death may be declared, despite the absence of direct proof of the person's death, such as the finding of remains attributable to that person. Such a declaration is typically made when a person has been missing for an extended period of time and in the absence of any evidence that the person is still alive – or after a much shorter period but where the circumstances surrounding a person's disappearance overwhelmingly support the belief that the person has died. Thomas Peter Lantos was an American politician who served as a Democratic member of the United States House of Representatives from California, serving from 1981 until his death as the representative from a district that included the northern two-thirds of San Mateo County and a portion of southwestern San Francisco. Lantos had announced in early January 2008 that he would not run for reelection because of cancer of the esophagus, but died before finishing his term. A Hungarian-American, Lantos was the only Holocaust survivor to have served in the United States Congress. Lidingö Municipality is a municipality east of Stockholm in Stockholm County in east central Sweden. Its seat is located on the island of Lidingö. The municipality is a part of Metropolitan Stockholm. The Swedish Royal Navy is the naval branch of the Swedish Armed Forces. It is composed of surface and submarine naval units – the Royal Fleet – as well as marine units, the Amphibious Corps (Amfibiekåren). Guy Fredrik von Dardel was a Swedish physicist who researched particle physics and participated in the establishment of CERN. Nina Viveka Maria Lagergren was a Swedish businesswoman and the half-sister of Raoul Wallenberg, and the leading force to find out what happened to him after his disappearance. She was the founder of the Raoul Wallenberg Academy. She also presented Sommar i P1 in 2014 on Swedish Radio. She was the mother-in-law of Kofi Annan. The Wallenberg family is a prominent Swedish family renowned as bankers, industrialists, politicians, bureaucrats, and diplomats. In search of someone willing and able to go to Budapest to organize a rescue program for the nation's Jews,  Olsen established contact with a relief committee composed of many prominent Swedish Jews led by the Swedish Chief Rabbi Marcus Ehrenpreis to locate an appropriate person to travel to Budapest under diplomatic cover and lead the rescue operation. One member of the committee was Wallenberg's business associate Kalman Lauer. At the height of the program, over 350 people were involved in the rescue of Jews. Sister Sára Salkaházi was caught sheltering Jewish women and was killed by members of the Arrow Cross Party. Raoul Wallenberg's half-brother, Guy von Dardel,  a well-known physicist, retired from CERN, was dedicated to finding out his half-brother's fate. He traveled to the Soviet Union about fifty times for discussions and research, including an examination of the Vladimir prison records. Over the years, Professor von Dardel compiled a 50,000-page archive of interviews, journal articles, letters, and other documents related to his quest. In 1991, Dardel initiated a Swedish-Russian working group  to search eleven separate military and government archives from the former Soviet Union for information about Wallenberg's fate, but the group was not able to find conclusive information. Many, including Professor von Dardel and his daughters, Louise and Marie, do not accept the various versions of Wallenberg's death. They continue to request that the archives in Russia, Sweden, and Hungary be opened to impartial researchers. More telling was a communique sent on 7 November 1944 by the OSS, Secret Intelligence Branch in Bari, Italy, which apparently acknowledged that Wallenberg was acting as an unofficial liaison between the OSS and the Hungarian Independence Movement (MFM), an underground anti-Nazi resistance organization. The OSS message notes Wallenberg's contacts with Geza Soos, a high-ranking MFM leader and further explains that Soos "may only be contacted" through the Swedish legation in Budapest, which was Wallenberg's workplace and also served as the operational center for his attempts to aid the Hungarian Jews. The same message's assertion that Wallenberg "will know if he (Soos) is not in Budapest" is also curious, in that by November 1944 Soos was in hiding and knowledge of his whereabouts would only have been available to individuals closely involved with the MFM. This conclusion is given further weight by additional evidence  suggesting that communications from the MFM to US intelligence were transmitted first to Stockholm and then relayed to Washington via Iver C. Olsen, the American OSS operative who initially recruited Wallenberg to go to Budapest in June 1944. 1 2 He is presumed to have died in 1947, although the circumstances of his death are not clear and this date has been disputed. Some reports claim he was alive years later. 31 July 1952 is the date of death declared by the Swedish Tax Agency in October 2016 and determined in accordance with Swedish law. 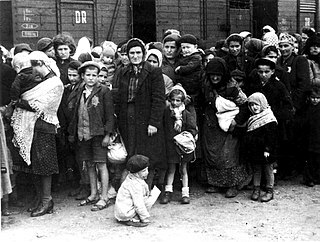 The Budapest Ghetto was a Nazi ghetto set up in Budapest, Hungary, where Jews were forced to relocate by a decree of the Hungarian Government during the final stages of World War II. The ghetto existed only from November 29, 1944 - January 17, 1945. Carl Lutz was a Swiss diplomat. He served as the Swiss Vice-Consul in Budapest, Hungary from 1942 until the end of World War II. He is credited with saving over 62,000 Jews, the largest rescue operation of Jews of the Second World War. Pál Szalai also spelled Pál Szalay and anglicized as Paul Sterling was a high-ranking member of the Budapest police force and the Hungarian Arrow Cross Party during World War II. The Raoul Wallenberg Award is bestowed by The Raoul Wallenberg Committee of the United States on "individuals, organizations, and communities whose courage, selflessness and success against great odds personified those of Raoul Wallenberg himself." It has been awarded periodically since 1985, when the inaugural award was given to Wallenberg himself. Károly Szabó was an employee of the Swedish Embassy in Budapest from 1944 to 1945. He was a supporter of Raoul Wallenberg and had a significant role in making contact with the representatives of the Hungarian police and other state officials. He was arrested without legal proceedings in 1953 in Budapest, in a secret trial. Perlasca – Un eroe Italiano is a 2002 Italian drama, directed by Alberto Negrin, about Giorgio Perlasca, an Italian businessman working in Hungary for his government. After Italy surrendered to the Allies, he took refuge in the Spanish Embassy. Aware of the threat to Jews, he first began to help them find shelter in Spanish safe houses. The International Raoul Wallenberg Foundation (IRWF) is a non-governmental organization which researches Holocaust rescuers and advocates for their recognition. The organization developed educational programs for school to promote peace and civil service. Founded by Baruch Tenembaum, it has offices in Buenos Aires, New York, Berlin, Rio de Janeiro and Jerusalem. Otto Fleischmann was a Hungarian-born Freudian psychoanalyst. The yellow-star houses were a network of almost 1,950 designated compulsory places of residence for around 220,000 Budapest Jews from 21 June 1944 until late November 1944. Both the houses and their residents were obliged to display the yellow star by Budapest mayoral decree. Tibor Baranski was a Hungarian-American man credited with saving more than 3,000 Hungarian Jewish women, men and children from the Nazis during the Holocaust. 1 2 Stockholm, Agence France-Presse in (31 October 2016). "Sweden declares Raoul Wallenberg dead 71 years after disappearance". The Guardian . 1 2 "A Swedish Rescuer in Budapest". Yad Vashem . Retrieved 15 April 2018. he saved the lives of tens of thousands of men, women and children by placing them under the protection of the Swedish crown. ↑ "Raoul Wallenberg's arrest order, signed by Bulganin in January 1945 – Searching for Raoul Wallenberg Searching for Raoul Wallenberg". Searching for Raoul Wallenberg. Retrieved 27 August 2018. ↑ Nadler, John (19 May 2008). "Unraveling Raoul Wallenberg's Secrets". Time . Budapest. Archived from the original on 12 January 2016. ↑ "Honorary Australian Citizenship to be Awarded to Raoul Wallenberg". Prime Minister's Press Office, Commonwealth of Australia. 15 April 2015. Archived from the original on 30 April 2013. Retrieved 6 May 2013. ↑ "The Raoul Wallenberg Committee of the United States – Our Mission". Raoulwallenberg.org. Retrieved 8 June 2013. ↑ "The Library of Congress: Bill Summary & Status 112th Congress (2011–2012) H.R. 3001". 1 2 3 4 Rachel Oestreicher Bernheim (1981). "A Hero for our Time". Archived from the original on 6 February 2007. Retrieved 12 February 2007. ↑ "Raoul Wallenberg's family, the von Dardel". Searching for Raoul Wallenberg. Retrieved 30 March 2016. ↑ "Guy von Dardel's introduction to the report of the Independent consultants " Searching for Raoul Wallenberg". Raoul-wallenberg.eu. Retrieved 27 May 2014. ↑ "03. Raoul Wallenberg; University and Training". Searching for Raoul Wallenberg. Retrieved 30 March 2016. 1 2 3 4 Schreiber, Penny. "The Wallenberg Story" . Retrieved 14 February 2007. ↑ Harvey Rosenfeld (2005). Raoul Wallenberg: The Mystery Lives on. ISBN 9780595355440 . Retrieved 30 March 2016. ↑ "Raoul Gustaf Wallenberg's Family Tree". Geni.com. Retrieved 30 March 2016. ↑ Bierman, John (1981). Righteous Gentile. London: Penguin Books Ltd. p. 25. 1 2 3 4 5 6 "Raoul Wallenberg". Jewish Virtual Library. 2007. ↑ The company name is sometimes translated as the "Mid-European Trading Company"
1 2 3 Lester, Elenore; Werbell, Frederick E. (30 March 1980). "The Last Hero of Holocaust. The Search for Sweden's Raoul Wallenberg". The New York Times Magazine . 1 2 3 4 "Raoul Wallenberg | Jewish Virtual Library". Jewishvirtuallibrary.org. Retrieved 28 June 2014. ↑ "PROLOGUE: Roots of the Holocaust". The Holocaust Chronicle. p. 526. Retrieved 30 March 2016. ↑ David Kranzler (2000). The Man Who Stopped the Trains to Auschwitz: George Mantello, El Salvador, and Switzerland's Finest Hour. Syracuse University Press. p. 87. ISBN 978-0-8156-2873-6. ↑ Winston Churchill, in a letter to his Foreign Secretary dated 11 July 1944, wrote, "There is no doubt that this persecution of Jews in Hungary and their expulsion from enemy territory is probably the greatest and most horrible crime ever committed in the whole history of the world...." "Winston Churchill's The Second World War and the Holocaust's Uniqueness" Archived 26 July 2007 at the Wayback Machine , Istvan Simon. ↑ "Bergson Group" (PDF). Shoah Resource Center, The International School for Holocaust Studies. Retrieved 9 June 2017. ↑ United States Holocaust Memorial Museum; Holocaust Encyclopedia Archived 3 May 2015 at the Wayback Machine . Retrieved on 27 January 2007. ↑ Garger, Ilya (2 September 2002). "Milestones: Died. Per Anger". Time . Archived from the original on 12 March 2016. Retrieved 13 February 2007. ↑ "Hundreds Honor Wallenberg at Concert". Apnewsarchive.com. Retrieved 13 August 2016. ↑ "The Wallenberg Effect". The Journal of Leadership Studies. Retrieved 15 February 2007. ↑ "Wallenberg Legacy". Raoul Wallenberg International Movement for Humanity. Archived from the original on 10 October 2007. Retrieved 14 February 2007. ↑ Kirst, Sean (27 August 2017). "Sean Kirst: He saved 3,000 Jews in World War II, now lives quietly in Buffalo". The Buffalo News. Retrieved 22 January 2019. "Spared Lives: The Actions of Three Portuguese Diplomats in World War Documentary Exhibition, Catalogue" (PDF). Raoul Wallenberg Foundation. Retrieved 9 April 2015. ↑ Milgram, Avraham (2011). Portugal, Salazar, and the Jews. Yad Vashem. p. 324. ISBN 9789653083875. ↑ McKay, C.G. (1 April 2008). "Raoul's Girlfriend, also assisted Wallenberg, as did her son. :a Historical Footnote". Raoul-wallenberg.eu. Retrieved 19 December 2017. ↑ Arthur Max and Randy Herschaft (27 April 2008). "Clues surfacing in Wallenberg disappearance / WWII hero may have had ties to White House; other data to be released". Associated Press . Retrieved 17 May 2009. ↑ McKay, Craig Graham (August 2010). "A Friend Indeed: The secret service of Lolle Smit" (PDF). Raoul-wallenberg.eu. Retrieved 19 December 2017. ↑ "Final Report of the War Refugee Board from Sweden". Archived from the original on 5 February 2007. Retrieved 14 February 2007. ↑ "Lantos's list". Jerusalem Post . Archived from the original on 21 January 2007. Retrieved 15 February 2007. Born in Hungary in 1928 to assimilated Jewish parents, he escaped from a forced-labor brigade, joined the resistance and was eventually, with his later-to-be-wife Annette, among the tens of thousands of Hungarian Jews rescued by the Swedish diplomat Raoul Wallenberg. 1 2 LaFraniere, Sharon (23 December 2000). "Moscow Admits Wallenberg Died in Prison in 1947". The Washington Post . ↑ "Jews in Hungary Helped by Swede". The New York Times . 26 April 1945. 1 2 3 Palmklint, Ingrid; Larsson, Daniel, eds. (2000). Raoul Wallenberg: report of the Swedish-Russian working group. Ministry for Foreign Affairs. New Series II, 0562-8881 ; 52. Stockholm: Ministry for Foreign Affairs [Utrikesdep. ], Regeringskansliet. ISBN 978-91-7496-230-7. LIBRIS 7645089 . Retrieved 13 February 2007. ↑ "Well Taken Care Of". Time . 18 February 1957. Archived from the original on 10 March 2016. Retrieved 14 February 2007. ↑ "SOVIET'S MEMO ORDERED WALLENBERG'S ARREST". Deseret News . 25 January 1993. Retrieved 28 June 2014. ↑ "Soviet double agent may have betrayed Wallenberg" Archived 9 February 2007 at the Wayback Machine ; Reuters; 12 May 2003. Retrieved on 14 February 2007. ↑ See Braham, Randolph (2004): "Rescue Operations in Hungary: Myths and Realities", East European Quarterly 38(2): 173–203. ↑ "Wallenberg fate shrouded in mystery". CNN. 12 January 2001. Archived from the original on 26 October 2007. Retrieved 14 February 2007. ↑ "Raoul Wallenberg, Life and Work". The New York Times . 6 September 1991. Retrieved 12 February 2007. The K.G.B. promised today that it would let agents break their vow of silence to help investigate the fate of Raoul Wallenberg, the Swedish diplomat who vanished after being arrested by the Soviets in 1945. ↑ "The Last Word on Wallenberg? New Investigations, New Question". Archived from the original on 14 December 2006. Retrieved 12 February 2007. ↑ "Stuck in Neutral: The Reasons behind Sweden's passivity in the Raoul Wallenberg case" (PDF). Retrieved 12 February 2007. ↑ "German's Death Listed; Soviet Notifies the Red Cross Diplomat Died in Prison". The New York Times . 15 February 1957. ↑ "Soviets Give Kin Wallenberg Papers". The New York Times . 17 October 1989. ↑ "Raoul Wallenberg, Life and Work". Archived from the original on 14 January 2007. Retrieved 12 February 2007. ↑ Brent, Jonathan (2008). Inside the Stalin Archives. Atlas and Co.
↑ Fedorov, L.A. (2005). Советское биологическое оружие: история, экология, политика [The Soviet biological weapons: history, ecology, politics] (in Russian). Moscow. ↑ "Cause of Death Conceded". Time . 7 August 2000. Archived from the original on 14 January 2009. ↑ Birstein, Vadim J. (2004). The Perversion of Knowledge: The True Story of Soviet Science. Westview Press. p. 138. ISBN 978-0-8133-4280-1. ↑ "Russia: Wallenberg wrongfully jailed". CNN. 22 December 2000. Retrieved 14 February 2007. 1 2 "Moscow releases Wallenberg files". JTA. 2007. Archived from the original on 21 June 2007. Retrieved 29 July 2007. ↑ Barry, Ellen (9 November 2012). "In Big New Museum, Russia Has a Message for Jews: We Like You". The New York Times . Retrieved 29 January 2013. ↑ "Raoul Wallenberg, Swedish Holocaust hero, executed in Soviet prison, diaries reveal". Jewish Telegraphic Agency. 7 August 2016. Retrieved 8 August 2016. ↑ Macfarquhar, Neil (6 August 2016). "From a Dacha Wall, a Clue to Raoul Wallenberg's Cold War Fate". The New York Times. ISSN 0362-4331 . Retrieved 8 August 2016. ↑ "Search for Swedish Holocaust hero". BBC News. 17 January 2005. 1 2 Levy, Alan (2003). Nazi Hunter: The Wiesenthal File. London: Robinson. ↑ Rosenfeld, Harvey (2005). Raoul Wallenberg: The Mystery Lives On. iUniverse. p. 164. ISBN 978-0-595-35544-0. ↑ Moshinsky, Efim (1987). Raoul Wallenberg Is Alive! The Amazing Autobiography of the KGB Officer Who Arrested Him in 1945. Jerusalem: Rescue Publishing. ↑ December 1993 interview by investigator Marvin Makinen of the University of Chicago. Makinen examined prison records and found additional evidence which seemed to possibly corroborate this. Arthur Max and Randy Herschaft, "Scholars run down more clues to abiding Holocaust mystery" Archived 26 February 2009 at the Wayback Machine , Associated Press, 28 April 2008. ↑ Keller, Bill (28 August 1990). "Soviets Open Prisons and Records to Inquiry on Wallenberg's Fate". The New York Times . Arthur Ochs Sulzberger, Jr. Retrieved 13 February 2007. ↑ Ireland, Judith (6 May 2013). "Man who rescued Jews becomes Australia's first honorary citizen". The Sydney Morning Herald . Fairfax Media . Retrieved 6 May 2013. ↑ "La soeur de Raoul Wallenberg se rendra à Moscou". Searching for Raoul Wallenberg. Retrieved 30 March 2016. ↑ "List of documents in Russian archives and relevant to the Wallenberg case". Searching for Raoul Wallenberg. Retrieved 30 March 2016. 1 2 Prager, Joshua (28 February 2009). "The Wallenberg Curse: The Search for the Missing Holocaust Hero Began in 1945. The Unending Quest Tore His Family Apart". The Wall Street Journal . Retrieved 4 March 2009. ↑ "Report on the activities of the Russian-Swedish working group for determining the Fate of Raoul Wallenberg (1991–2000) – Searching for Raoul Wallenberg Searching for Raoul Wallenberg". Raoul-wallenberg.eu. Retrieved 21 September 2014. ↑ "Missing in Action: Raoul Wallenberg". Jerusalem Post . Archived from the original on 27 January 2007. ↑ "Russia says the Wallenberg case is still open (link broken)". The Times-Picayune (Saint Tammany Edition). New Orleans. 29 May 2012. p. A7. Archived from the original on 30 January 2013. Retrieved 30 May 2012. ↑ Eriksson, Martin; Töpffer, Michael (29 March 2016). "Raoul Wallenberg begärs dödförklarad" [Petition to declare Raol Wallenberg dead]. Expressen (in Swedish). Retrieved 31 March 2016. ↑ Svensson, Frida (29 March 2016). "Raoul Wallenberg begärs dödförklarad" [Petition to declare Raol Wallenberg dead]. Svenska Dagbladet (in Swedish). Retrieved 31 March 2016. ↑ "Sweden declares Holocaust hero Raoul Wallenberg officially dead". BBC News. 31 October 2016. Retrieved 31 October 2016. ↑ "Raoul Wallenberg har förklarats död". Expressen. 1 2 "The Angel Was a Spy – US News and World Report". Archived from the original on 12 January 2012. Retrieved 28 June 2014. ↑ "Raoul Wallenberg's Unexplored Intelligence Connections in Hungary " The International Raoul Wallenberg Foundation". raoulwallenberg.net. Retrieved 28 June 2014. ↑ Subak, Susan Elisabeth (2010). Rescue and Flight: American Relief Workers Who Defied the Nazis. University of Nebraska Press. p. 342. ISBN 978-0803225251. ↑ "Authors Claim Wallenberg Family Assisted Nazis in Banking Deals". Jewish Telegraphic Agency. 8 November 1989. Retrieved 13 August 2016. ↑ Gowland, Rob (19 June 1996). "Banks' nazi connections exposed". The Guardian (Socialist Party of Australia). ↑ "Fiction as a Means to Uncover the Truth" . Retrieved 13 August 2016. ↑ "Raoul Wallenberg". Notable Names Database . Retrieved 12 February 2007. ↑ Louise von Dardel's February 2005 talks in the Knesset and the Jerusalem Begin Center and her interviews at the time to Israel TV English news, Jerusalem Post , VESTY (Russian) and Makor Rishon (Hebrew). ↑ "FAM – In English". Fam.se. Archived from the original on 14 July 2014. Retrieved 27 May 2014. ↑ Braham, Randolph L. (2004). "Rescue Operations in Hungary: Myths and Realities". East European Quarterly. 34 (2): 183–184. ↑ Bauer, Yehuda (1994). Jews for Sale? : Nazi-Jewish Negotiations, 1933–1945. New Haven: Yale University Press. pp. 234, 238–239. ISBN 9780300059137. ↑ "Raoul Wallenberg in film". Open Society Archives. Archived from the original on 21 June 2010. Retrieved 30 January 2010. ↑ "News". Emic.ee. Retrieved 30 March 2016. ↑ "Oper & Tanz 2001/04: Berichte, Uraufführung von Tüürs 'Wallenberg' in Dortmund". Operundteanz.de. Retrieved 30 March 2016. ↑ "- Programm – Badisches Staatstheater Karlsruhe". Staatstheater.karlsruhe.de. Retrieved 30 March 2016. ↑ "Operacompetition – Hasznos infók egy helyen". Operacompetition. Retrieved 30 March 2016. ↑ "Holocaust education fund to honor Raoul Wallenberg". New Jersey Jewish News – NJJN. Retrieved 30 March 2016. ↑ "Rude Awakening album". Andyirvine.com. Retrieved 21 September 2014. Wikimedia Commons has media related to Raoul Wallenberg .